Tonic II’s clean, beautiful lines create calm and serenity allowing you to transport yourself from today’s hectic lifestyle and truly relax. Each piece is carefully considered and benefits from innovative features allowing you to transform and making your experience in the bathroom one of peace and tranquillity. A wide range of sizes and models available allows you to tailor create your perfect bathroom. The very latest technology is built into every product; sensor ambient lighting; ingenious, spacious storage options with soft-close features; water saving technology, brand new rimless WCs and ground-breaking AquaBlade® flush technology: together these unique features help make Tonic II the paramount choice for a designer, contemporary bathroom that delivers against both form and function.The subtle beauty and pure design of the Tonic II range was created by design agency ARTEFAKT who's owners Achim Pohl and Tomas Fiegl are passionate about crafting bathroom solutions to work for every individual's requirements. The versatility of the range is showcased through various options for large, small and guest bathrooms. Whatever products you choose from the stylish Tonic II range, you can be sure of a contemporary, luxurious bathroom with everlasting design. The modern, yet classic styling enables Tonic II to achieve a timeless quality that will continue to look its best for years to come. At Ideal Standard, we believe a bathroom serves more of a purpose than quality design alone. Paired with innovation and functionality, a bathroom becomes a complete solution that meets the demands of today’s complicated lifestyle. A bathroom is a haven for those escapism moments, it’s a room of vital importance in your home and it’s a space for transformation and beauty. Tonic II allows you to truly feel at home with subtle, pure lines and a delicately chic colour palette, that works harmoniously in any surrounding. We’ve created a brand new innovation within the new Tonic II toilet called AquaBlade®. 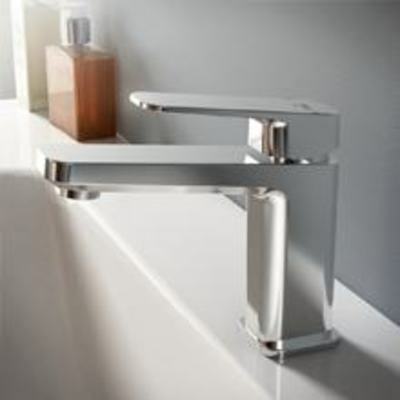 It features sleek and clean lines that look both stylish and contemporary in any bathroom. Combined with the new AquaBlade® technology, the Tonic II WC sets new standards in both toilet design and optimum flush performance. The exclusively engineered integrated channel generates an incredibly powerful, smooth and homogenous water flow from the top of the bowl. AquaBlade® cleans more of the ceramic surface, even at low water volumes. In traditional box-rim toilets, approximately 20% remains unwashed after flushing. However, AquaBlade® washes 100% of the surface beneath the slot and cleans every part of the WC, including the back. So not only do you save water, the combination of elegant, modern design with easy to clean form and the very best in flushing performance, makes this WC with AquaBlade® the superior choice for you to enjoy a pristine bathroom. Tonic II presents beautifully proportioned, distinctively contoured, refined ceramics: the luxury pieces come in different sizes. Whatever your space or individual tastes, you’re sure to find a solution from within the Tonic II range. 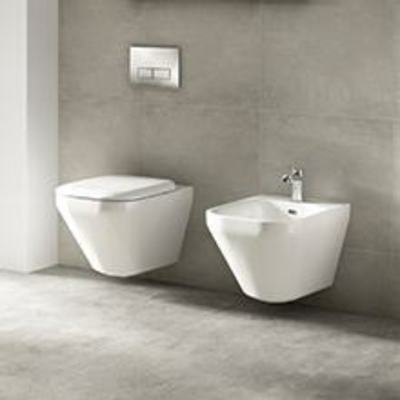 The smooth, pure lines of the basins create an effortless aesthetic. They are available with the addition of a coloured rim. Save-spacing siphon included. Create an eye-catching design statement with the beautiful, soft geometric lines of the Tonic II vessels, designed to pair with furniture units or to stand proud atop worktop surfaces. 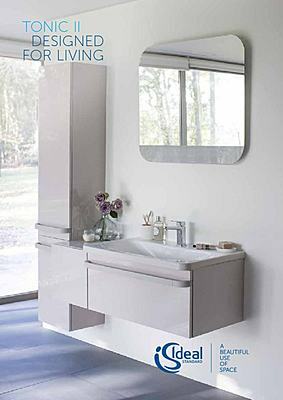 Choose from a wide range of sizes from the larger double vanity basin, through to smaller guest solutions for en-suites or cloakrooms. Whichever you choose, the elegant curved shape will look contemporary and elegant in your bathroom. 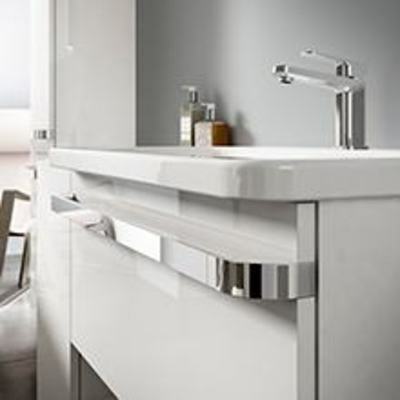 Tonic II furniture solutions are excellently thought out and considered, helping to keep a very well organized bathroom. Choose from a range of modular furniture pieces to create the perfect look and functionality for your space. 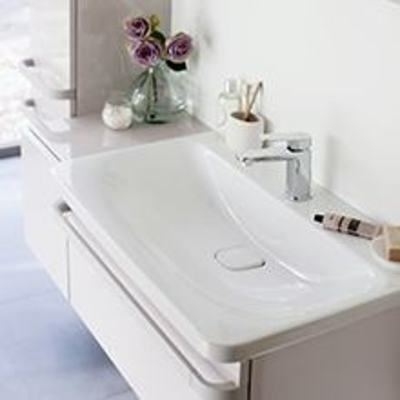 Designed to work seamlessly with vanity basins and vessels, these basin units enable the rest of your bathroom to have a feeling of serenity with the reduction of clutter. Save-spacing siphon included. Basin structures offer both a bold design statement and an additional shelving solution. Combined with Guest basins they bring a feeling of serenity with the reduction of clutter. Available in all of the furniture colours, they can be used alongside the vessels by drilling the tap hole into the worktop, completed onsite by your installer, or as an additional shelf on top of a basin structure. The worktops of tempered glass in an elegant white finish, are fully compatible with the Tonic II symmetrical and asymmetrical vessels and are available with and without a tap hole for complete flexibility in your Basin mixer positioning. Choose the perfect shelving for your chosen basin unit and give your furniture the storage capability to de-clutter your beautiful bathroom. These gorgeous examples of cabinets feature glass shelves and drawers in the 60cm option to store all of your beauty and bathroom products. With luxurious touches such as push and open doors and soft-close drawers, they will help your bathroom look its best. Tonic II mirrors are provided with a sensor light which provides the perfect ambiance and delicate lighting to assist with beautifying and transformation. Each is also fitted with intelligent antisteam technology, keeping your mirror clear for when you need it. 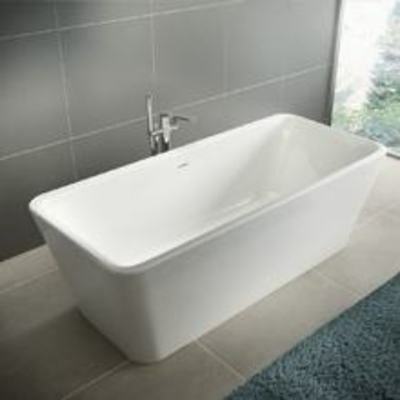 The bath is an absolute necessity for those who want to relax and to indulge in their bathroom environment. Tonic II has beautiful solutions to work with every shape and sized room, from gorgeous free-standing baths that look stunning as a centrepiece, to D-shape and even rectangular options for a more standardized set-up. You can choose a freestanding, D Shaped or rectangular bath, or decide on double ended with a central plug, or single ended. Tonic II encompasses a range of striking taps and mixers and thermostats allowing you to add the perfect finishing touch to your bathroom. Packed with innovative technology and other features they are the perfect addition to your contemporary bathroom. You could choose between the standard size basin mixers and vessel, Piccolo, mixer with high spout and built-in basin mixer. Its design is about defining how you use the space to fit your life. It’s about creating a look. Make your bath feel sensational. Complete your Tonic II design with Idealrain Cube showers sets for shower and bath. Or you could choose the 3-hole rim-mounted mixer with/without spout for a bigger comfort. Make your shower sensual. 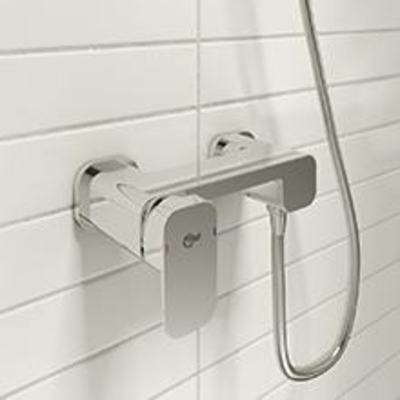 Complete your Tonic II design with Idealrain Cube showers sets for shower. Combine it with Tonic II freestanding bath and show an eye-catching aesthetic with this iconic centrepiece in the middle of your modern bathroom.